Hi, I’m Lotte, born and raised in the Netherlands, happily married to Frank and mother of our little boy D. I’m trying to combine a full-time job, family life and exploring as much of the world as possible! Up until now I lived in Barcelona, London and Amsterdam and visited 40+ countries. 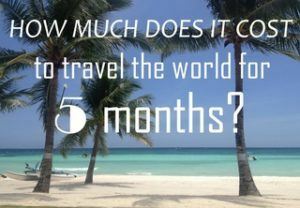 I have always loved travel, but in 2015 a lifelong dream came true: a 5-month trip around the world! This unforgettable trip inspired me to start Phenomenal Globe Travel Blog, a place where I document and share my travel experiences. I absolutely loved the feeling of ultimate freedom travelling for months gave me. No plans, no responsibilities, just freedom. I relished the uncomplicated life of being able to fit everything I own into a backpack and move to the next exciting place. I loved meeting new people from different cultures and eating delicious food from tiny street stalls. I felt thoroughly happy with the little things in life, like a beautiful sunset or a walk on the beach. INSPIRE YOU TO TRAVEL AND HELP YOU PLAN YOUR TRIPS! Organized as I am (my friends and family would say this is an understatement☺), I write down every nitty-gritty detail about my travels. And I love sharing my stories and advice on this blog! This blog started as a hobby and for almost 2 years I combined a full-time job in finance with traveling the world and writing about my adventures. I made amazing trips to Cuba, Japan, Thailand and several countries in Europe. Of course I’ll continue sharing our adventures with you, you can read about them on the blog or follow me on Facebook and Instagram! … my husband Frank, we have been happily married for eight years. He is my high school sweetheart and we have been together since I was 15 years old. … my baby boy D., he makes me smile every day. … good coffee, fresh smoothies and eating my way around the globe (Japanese, Thai, Indian, Vietnamese, you name it;-). … hiking, skiing and diving. In general, I love being outside and being physically active. … the sweetest parents in the world who took me and my sisters on awesome holidays from a very young age. … three younger sisters (with lovely husbands), they are the best! … I bought my first car ever in Canada, for our road trip around North America. Where to start on Phenomenal Globe Travel Blog? In the Phenomenal Globe Travel Planning Library you can find all my travel planning resources such as tips and advice, budget information, travel itineraries, my packing lists and other convenient & downloadable information. If you are looking for recommended accommodation around the world or my favorite travel gear, check out the Travel Resource Page. On the Destinations page you can see which countries I’ve visited and written about. All my posts can be found on the Blog page or in the Archives. And if you want to get in touch, feel free to send me a message, I’d love to hear from you!